The red turrets of the sprawling Victorian resort come into view as you approach on the Coronado Bridge. Rather than queue with the masses of visitors at the main property, you, as a guest of Beach Village, can access your oasis of cottages and villas via a private entrance with a dedicated valet service. A small army of hosts await with welcome drinks in hand to ensure that your stay is memorable and hassle-free. 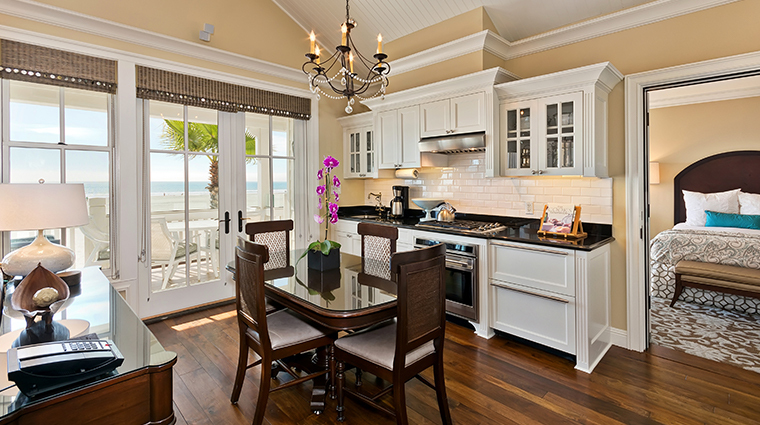 Whether your dream vacation involves arriving to a fully stocked professional kitchen, enjoying a candlelit dinner on the sand, having a surfboard delivered to your room or being handed the keys to a vintage convertible upon arrival, the staff at Beach Village is prepared to make it happen. Per California law, there are almost no hotels with private beaches in the state, but the historic Hotel Del is one of the few exceptions. As a guest of Beach Village, you have access to a private beach club (from Memorial Day through Labor Day), where you can enjoy cocktail and food service while lounging on plush chaises under fringed red and white umbrellas. A plethora of customizable onsite and offsite experiences is available, including private beach bonfires, chartered boating excursions and surf lessons. If you can imagine it, the staff likely can make it happen. Even during the 19th-century boom of seaside resorts in America, the Del stood apart for its sheer size and distinctive Victorian architecture, which was more commonly found on the East Coast. Though the Beach Village was newly added in 2007, it maintains the same charming Victorian aesthetic as the original structure, which was completed in 1888. In addition to the village’s private Windsor Beach Club, restaurant and pools, you are also granted preferential access to all the amenities on the main San Diego hotel, with priority seating at the dining venues and special perks, like pre-sized skates delivered to your suite during the holidays, when the main lawn is transformed into an ice rink. The pet-friendly resort maintains an array of amenities for your four-legged companion, from on-demand sitting and grooming, to rooms outfitted with organic treats and plush beds. Just down the boardwalk, you will find the Coronado dog beach, a popular off-leash stretch of sand where your furry friend can run wild. Prior to your stay, a Beach Village host will call to help curate your trip. Almost anything can be arranged, including pre-arrival grocery shopping, behind-the-scenes tours of the San Diego Zoo and sports car rentals. Cottages are positioned directly on the sandy boardwalk, while villas offer the privacy of being set back from the main drag. Third-floor and most second-floor villa rooms feature stunning ocean views. Beach Village has its own private dining establishment, the beachfront Windsor Cottage, which serves a daily complimentary breakfast buffet followed by a grill-focused menu and cocktails in the evening. 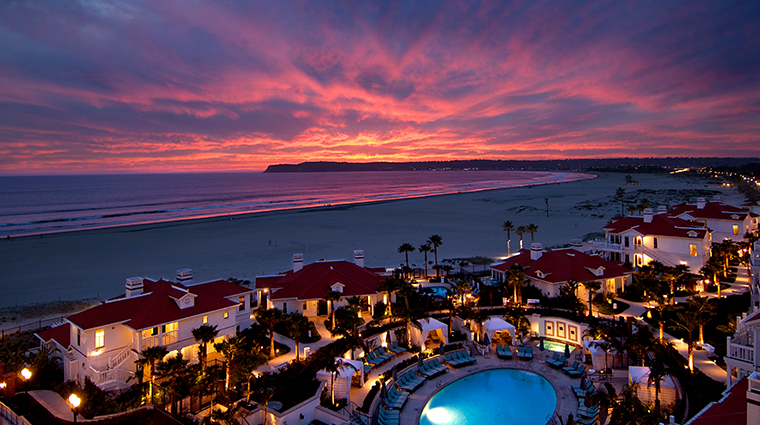 Hotel del Coronado has been a popular destination for celebrities since its inception, and in 1958, it served as the set for the classic comedy Some Like it Hot, starring Marilyn Monroe. These days, star guests prefer the privacy of Beach Village over the main property. 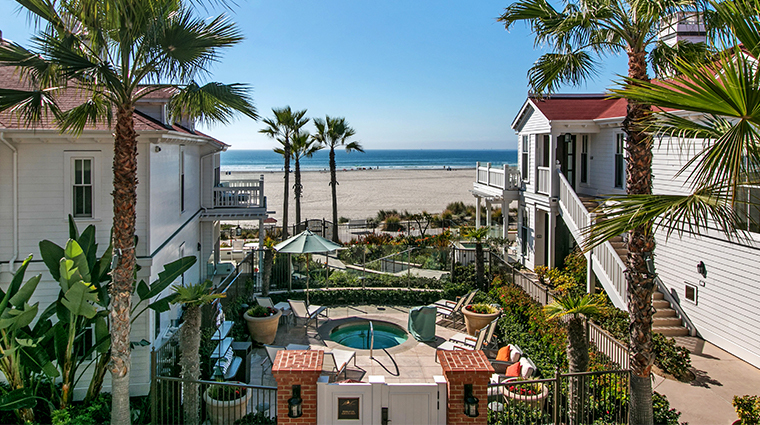 This boutique resort-within-a-resort has 78 rentals available, all adorned with a cozy fireplace, a marble bathroom and a patio or balcony for enjoying those spectacular ocean views. The cottages can be rented in their entirety as a three-bedroom option, including two outdoor soaking tubs and a central fire pit. The accommodations also can be rented in sections as one- or two-bedroom configurations. The rooms feature a coastal-chic vibe with a neutral color palette accented with pops of turquoise in the form of glass lamps, throw pillows and cozy armchairs. A blend of mix-and-match patterns keeps the spaces stylish but fun. 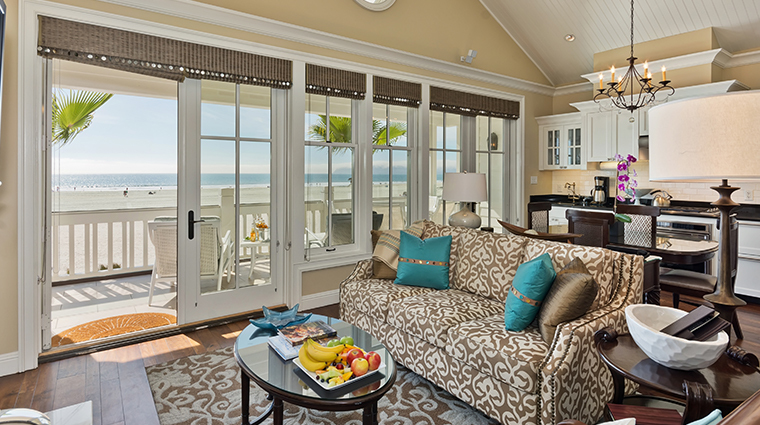 The Coronado hotel's Oceanfront Cottage Horizon Suite is the only one of its kind and is designed for entertaining. Set on the second floor of a beachfront accommodation, the suite has a king bed, interior fireplaces and a wrap-around terrace with a whirlpool tub and plenty of outdoor seating for gatherings. 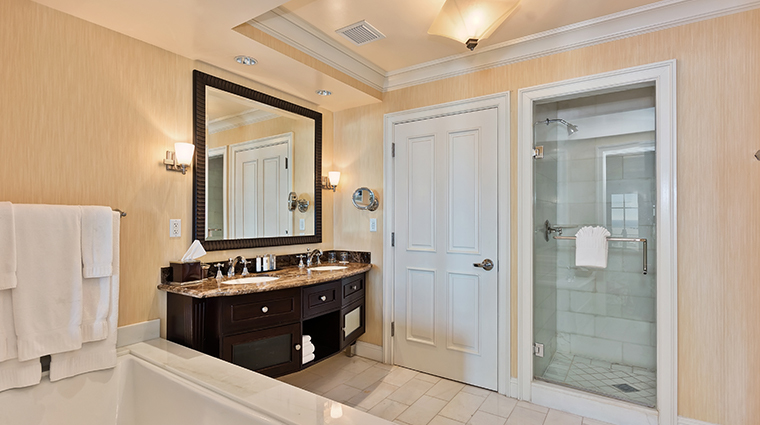 All rooms have massive soaking tubs and stand-up marble showers, and the suites also include a professional-grade kitchen where you can cook or have a hotel chef come and prepare a private meal for you. Bill Pavlacka, “The Sandcastle Man,” sculpts his creations on the beach in front of the luxury hotel. The award-winning artist is usually there Thursdays through Mondays working on his masterpieces, which typically last only a few days. The nearby Village Theater was built in 1947 and boasts an incredible art deco interior that is as much of a draw as the films shown on its three screens. Author L. Frank Baum wrote The Wonderful Wizard of Oz from his winter home on Coronado Island, and there are many nods to him and his iconic work throughout the town. His home — 1101 Star Park Circle — is privately owned, but remains a stop on many historic walking tours; the Coronado Library has an Oz-based art collection on display; and the chandeliers that adorn the Crown Room in Hotel Del Coronado were designed by Baum himself. 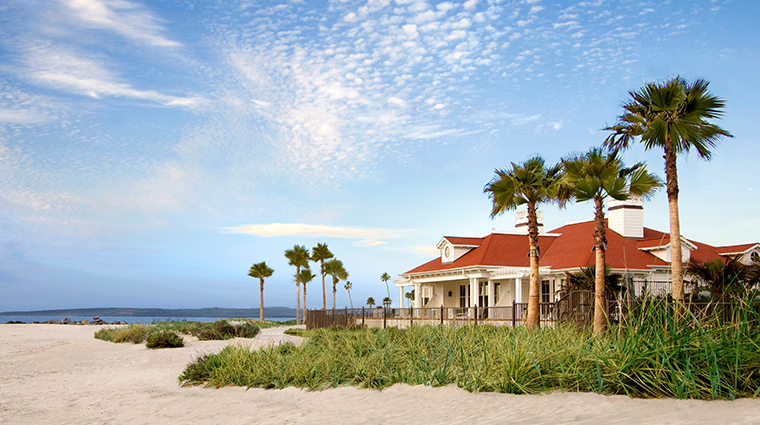 The six-mile beachfront boardwalk takes you almost all the way around the island. The route provides an easy bike ride, but be sure to take a detour and cut inland to tour the picture-perfect historic residences. Take the ferry from the east side of the island to downtown San Diego, where you can explore the swanky neighborhood of Little Italy or the bar- and restaurant-packed Gaslamp District on foot before heading back to your luxurious beachfront enclave.